We don’t often talk about weddings on the blog, perhaps because we have both been married for quite sometime now, and all the fun, anxiety, hustle and bustle is long gone from our lives (of course no matter how crazy it gets it is one of the best days of someone’s life). Nonetheless bridal fashion is a huge part of the fashion industry and has gained some fodder thanks to shows like TLC’s Say Yes To The Dress. In recent days however, bridal fashion has taken the spotlight due to a couple of celebrity weddings. Surely millions of hearts broke (both male and female) as two of the hottest celebrities in Hollywood wed in Italy over the weekend. Justin Timberlake, every woman’s favorite N’ SYNC member and Jessica Biel, every man’s favorite 7th Heaven daughter, celebrated their nuptials in style. By now I’m sure you’ve heard that Jessica decided to go the non traditional route with a pink Giambattista Valli dress. As soon as I heard the news I couldn’t wait to see it…I’ve been obsessed with non-white dresses since Jennifer Lopez wore one in the movie Monster In Law. I think she looked beautiful in the uber feminine gown (love the tiers of ruffles), which complimented her fresh faced makeup… She is positively glowing, but I mean I woud be too if I had just married Justin Timberlake! Sigh…. Just a few weeks earlier, my favorite actress, Anne Hathway also tied the knot in, yes, a pink dress! Anne earned the envy of women around the world, not because she married a hunky pop star, but because she got to wear a dress made for her by Valentno. The fashion icon may have retired in 2008, but there was no way he would deny his muse the perfect wedding dress. Unfortunately we only get a few fuzzy pictures taken by paparazzi…. But we do have a sketch of the ethereal look on fashionista.com. 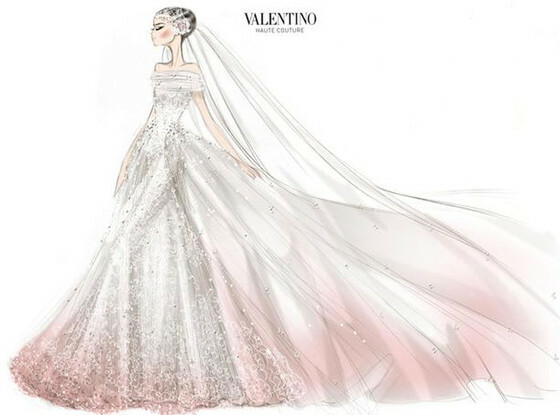 A rep for Valentino told People that the ivory silk point d’esprit tulle dress had a train embroidered with satin flowers and was hand-painted pink. Valentino himself (who retired from him namesake brand nearly five years ago) designed Hathaway’s gown, which was then whipped up in Rome at the house’s couture atelier. All this talk of pink wedding dresses has me thinking I may need to start planning a vow renewal for the near future…. Because you know I really love him… And the idea of me wearing the perfect blush colored designer frock!